"The miracle isn't that I finished Race. The miracle is that I had the courage to start"
We provide Running Enthusiast with information on running such as gear review and training tips, provide updates on forthcoming local and overseas running events and motivate runners to attain their running goals. Need us to review your product? 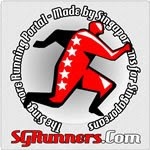 We review Running Events and Gears. Click "Sign me up!" to subscribe. I ♥ Running.. Sign me up!